I will develop this article more later. But as you start to run down the rabbit hole, you have to shake your head at how our best and brightest can ignore the damage they are doing to society. Treatment with radiation is BARBARIC! 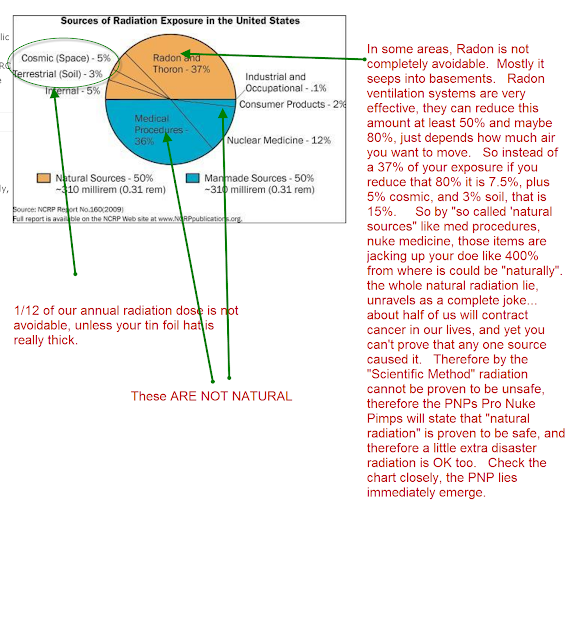 Background Radiation is around 1 mSV in the USA if you are not dosing yourself stupidly with Radon or Radium, both easily highly reduced with simple cheap methods. But the USA AVERAGE dose due to medical procedures, averages out for every man woman child to 3 mSV per year. They have tripled our dose in the name of medical "treatment". Thank you very much I will pass on that treat. This is most clear when they use dangerous methods to "treat" someone, even though much better and safer methods are available. Here is a particularly barbaric test (that is fortunately falling out of favor) is which a patient is dosed with 2 types of radioactive cobalt. Walking in the wind gave me skull cancer in 2011, they did a FLAP and repaired the sarcoma bone damage with my right leg fibula bone, and did cardiovascular reconstruction of blood vessels to feed the fibula bone blood in my jaw, and nasal. Now due to needing exorcise to survive that operation, I have lymphatic cancer in several places and am on chemo-like immune therapy infusions. They just diagnosed my wife with liver cancer after her colon cancer operation last Christmas time, and she now needs a chemo pump, and a heart port. Those airborne 'specks' from wherever sure have taken their toll on us indeed! The treatment is much like getting a Bremsstrahlung cooling, or breaking effect x-ray, but the radiation is more intense. Nausea and diarrhea are more common if the abdomen is treated with radiation. Radiation to the head and neck area can lead to mouth sores and trouble swallowing. Some patients later have problems with dry mouth. Radiation to the chest can lead to irritation of the esophagus. This can lead to pain swallowing and trouble eating. Possible long-term side effects of radiation therapy can be more serious. • Chest radiation therapy may cause lung damage and lead to trouble breathing. It can also affect the heart, making you more likely to have a heart attack later on. • Side effects of brain radiation therapy usually become most serious 1 or 2 years after treatment and may include headaches and problems such as memory loss, personality changes, and trouble concentrating. Please folks if they tell you that this high energy x-ray farce is needed for you or a loved one; do indeed look into the alternatives. Background is 3-5 mSv/yr depending where you live. In certain parts of the world it's above 10. I'm wondering if you understand we live in an inherent radioactive world. You can't escape it as long as you are hwre. If you rocket off to another world it will be there too, as well as the space between. The risks of low low mSv level radiation are practically immeasurable. Incorrect, a false baseline is one of the lies of the mukist out of the gate. Anyone can look at the pie chart and quickly see the very small 3 slices that we can't avoid. About 1 mSV. 2nd lie, even very low mSv, say 4 msV cumulative, is shown by very powerful scientific tests to prove statistically significant increases in cancer. Per usual, you didn't even read the article, shame, shame on you nukist. I read it.Its not ready for prime time in the circles I run. Ya you keep on running in those circles, killing people, and chasing the precious. Naturally occurring radiation is one thing but having to accept man-made radiation is quite another! Say N☢ to using Nuclear! That's a ridiculous statement. Radiation is a quanta of energy. Every isotope exists in nature. Even Pu239. There is just not enough in one concentrated location. A stray cosmic ray neutron captured in U238 in the ground will make a plutonium 239 atom in the ground. Man didn't create the nuclear structure of matter. He just builds machines that concentrate and harness the incredible amount to of energy in as little volume as possible. Power density. Of course we live in a radioactive world, Loose Nuke, this author is not disputing that - just pointing out two things: as the radioactivity to which a person is exposed, the numbers of damaged cells or amount of damaged molecules in cells increases thereby increases a number of different diseases, especially cancer but also auto immune, likely cardiovascular, and certainly has teratogenic and genetic effects AND the largest exposure is likely to be the result of medical procedures. No one is contesting the existence of a radioactive world - unfortunately, an increasingly radioactive world. Our natural radioactive world poses no adverse health issues. The human population has exponentially grown during the atomic age. Why is that? Antinukes claim more cancers yet 1) more people and 2) more confounders. People like the author think that without nuclear there would be no cancer. That's a naiive position and one that doesn't recognize any causal effect to low level radiation hasent been vetted. Oh wow, using the total amount versus rate of cancer false argument, my that is weak. 1900 is was 6% now its 66%, do the math, 11 times more. And skyrocketing right at 1945. Plenty of studies showing for sure that even low level radiation causes cancers and other diseases. 1900 was a pure industrial age and the world population was about 1/10 of what it is today. A lot of things came to be in the last 100 yrs.You realize air quality from burning fossil fuels including automobiles is the most likely culprit. It's not low low radiation levels. It's the air. Think about that the next time you fall for the banana in the tailpipe. Disagree. No vetted study shows a link between low low radiation levels and cancer. There is a difference between vetted and peer review. Vetted is a more thorough scrutiny by an entire community. Peer review is one guy.And that guy may not be independent. No go, the ol "must be vetted" lie. And of course, everyone will have to agree with the study, including the IAEA, nukists, the WHO(RE) to the IAEA. Plenty of HIGH POWER studies that leave no doubt, and theory also predicts the same. Chronic low dose via man made nuclides is worse than occasional higher dose, even internal. PS I know of no place on earth that it naturally 10 mSv so please inform me. Ramsar Iran, I call it the Ramsar lie. They say everyone is super healthy, lol google it. The cancer rate there is lower than that in Wisconsin. Too much cheese in the head I suppose. Some beaches in brazil, underground coal mines.very high elevation locations..etc. it's not that hard to find 1 rem per year in nature. Oh ya, those coal miners do just dandy in health, lol. Radon trapped in coal is released with each burn. Ah yes, the old "coal lie", no we aren't pro-coal, and Germany is also reducing coal use as they eliminate nuke, and roll out solar PV.